This book was borrowed from Basheer bookstore for this review. 72 Transformations is actually part of the Fantasy+ series of art books. The curator is the same, Vincent Zhao. The publisher is CYPI PRESS. It's a 264-page paperback. 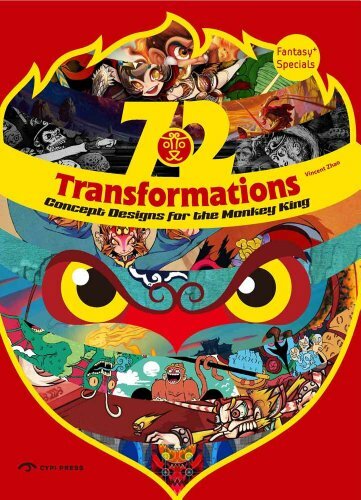 The book features the concept designs from 72 artists for Sun Wukong, also known as the Monkey King. For those who don't know, he's the main character in the Chinese novel Journey to the West. The quality of the selected works in the book are fantastic. There is a wide variety of styles and ideas. I like most of the artists' impressions but some Monkey King incarnations are a bit difficult to recognise. In terms of styles, there are sculptures, sketches, Q-style, cartoony, manga, Chinese painting and even a photo shoot. There are also art on T-shirts, and even on the side of a bus. There are quite a few sculptures and those are really great, and they even come with writeup on the making process. In fact, many of the digital paintings also come with step by step tutorials. Some of the ideas are really fun. You can see the Monkey King as mechas, Mega Man form, in a road trip movie poster, etc. Besides the tutorials, the artists also talk about their ideas and what they think about the Monkey King. It's a very creative and fun book. Easily recommended. I picked one up! This book looks sweet.